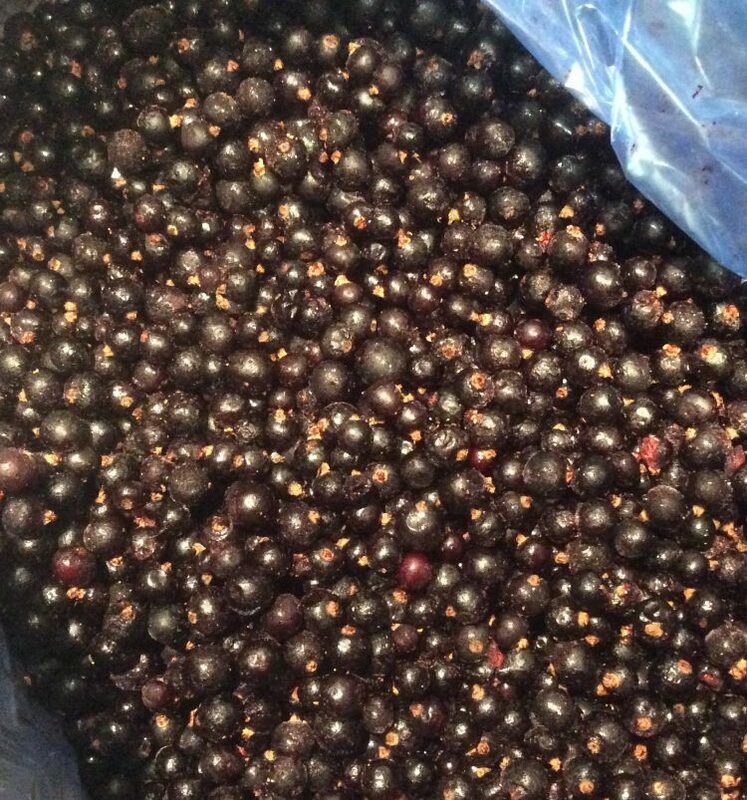 My mission was to get a supply of, what is, probably, the fruit, with the highest content of Vitamin C and Antioxidents, of any fruit grown in Ireland -Blackcurrants. Blackcurrants, particularly those grown in Ireland,also have an intense flavour that is pure nectar and is just not matched by any other fruit. I missed the harvest by a week! 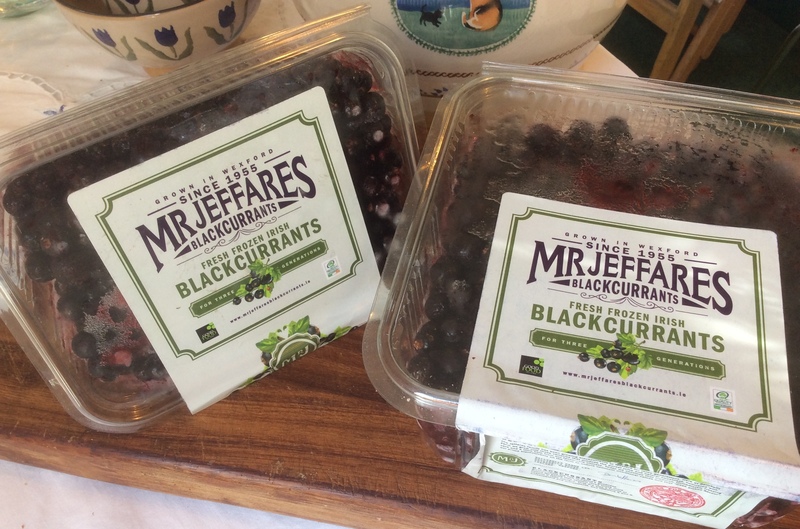 When I arrived at Des Jeffares farm, in Wexford, all of his blackcurrants had been picked, prepped, fast frozen and packed away in his cold storage facility. Des has a unique position. 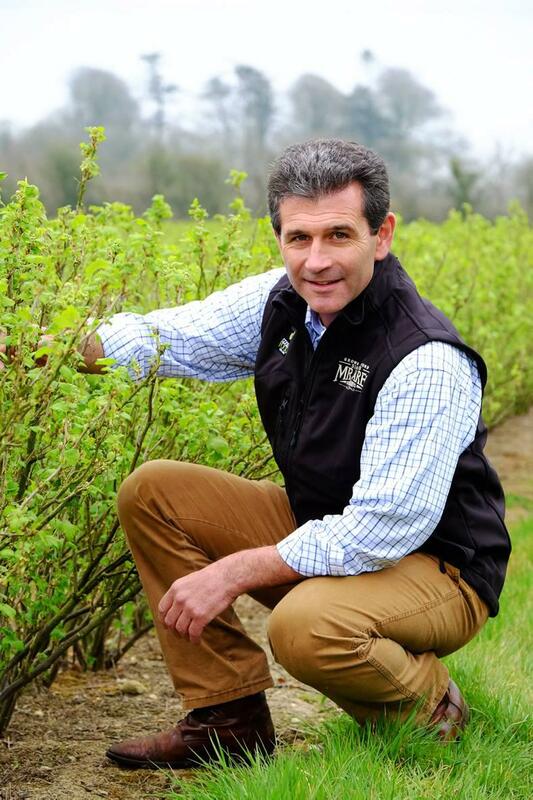 He is Ireland’s only major blackcurrant producer. I had hoped to collect some fresh blackcurrants, but as Des explained, that because of the quantities involved and to protect the quality of the fruit,mechanical harvesting and freezing were the best options. Harvesting takes place between mid-July and mid-August,depending on the variety and the weather conditions. When the majority of blackcurrants on the bush are at peak ripeness, the whole field is harvested, in a single day,using special equipment. The fruit is then Individually Quick Frozen (IQF). IQF preserves the fruit in peak condition and ensures noneof the flavours and nutrients deteriorate.This means that if you want to get a supply of World Class, Irish Grown Blackcurrants, they will almost, of necessity, be frozen but available for 12 months of the year. Des supplies his blackcurrants to Jam Makers, YoghurtMakers and directly to end users. He also produces a sugar and sweetener free blackcurrant cordial, with a lusciousflavour and markets it under the Mr. Jeffares label. He is, also, currently developing a retail pack of fruit,for the freezer shelves of the major supermarkets. His website is also packed with recipe ideas for getting the most from your supply of blackcurrants. The aim of this blog is to promote seasonal availability of fresh fruit and vegetables.